This was done at the 2015 Hershey RV Show. Kevin: Okay we get a lot of questions about how do you guys actually do these reviews? How are they trustworthy? Is it technical review? Is it just an observational review? Let me tell you right now they are observational reviews. We are not going to spend a lot of time on the technical aspect. We can look in brochures. We can talk to the sales folks. The manufacturer provides a lot of great information about the technical aspects of each RV. What we’re looking for is: what does it look like what does it feel like as you get in this RV, right? I’m going to take just a few moments here and I’m going to walk you through the steps that we go through to look for when we actually do one of these reviews. Follow along with me as we go. The first thing I’m going to do is to look at the outside of the RV and what is it that I see? I’m trying to look for things that are of interest to me. Things that may help me when I’m setting up the RV or packing up cargo space. This one has a really great pass through storage in the front. Notice there’s no access to it from the front, but the front does have it’s own cargo space. So that’s cool. That works. That’s great. Then notice this tray. Some RVs have these now down here. This tray here is a rubberized or plastic tray and that allows you to put maybe your dirty tools or maybe you have some liquids you want to store there so you don’t get it back on the carpet, right? That’s great. As we look through, let me see what else. Look at these steps. This is great. Sturdy aluminum steps. This is fantastic. Looking up, I think there’s a light. Look at that. There’s a step light right there too. That’s going to be great at night. As I cruise through here, look at the suspension under here. That looks fantastic. That gets me excited. It’s going to ride nice and comfortable. Let’s walk around the back. What do we have back here? All right, okay, look at this, here’s something different. Some RVs will have a 4-inch steel bumper that goes all the way across. This one does not. That’s not necessarily a bad thing. It has a hitch. We could easily throw a bike carrier on there or some other things you may want to store on the back of your RV, maybe a cargo carrier, like the flat ones that you put in there. We still have some options back here. Just because we don’t have a bumper, doesn’t mean we don’t have options. Second, we’re going to go ahead and start walking in the RV here so I can look pass around this. What do we feel like? What does it feel we walk in this RV? This is a pretty standard rear living set up for a Fifth Wheel. When I walk in, what’s my feel and what do I get? I can see it’s pretty open. Notice it’s got dual opposing slides on both sides. That makes this just real wide open in here. It feels great. Let’s start in the back of the Fifth Wheel. As I walk in, what do I see? What’s going to help me? What’s going to be a benefit to me when I live in this RV or camp in this RV that I’m going to enjoy? I notice right away, look at these tables down here on the ends. These are great, big long tables. Look at the cabinet, that’s fantastic. I’ve been in enough of these that don’t have cabinets. That’s great. It’s going to help me up, some little extra storage there. Now, I’m looking around, I’m sitting. Here’s my seating. I have fantastic theater seating here. I can kick back, relax. That’s right across from the television so that’s great. But my couch here, see this seat in the corner, I’ve wondered if I sit in this, can I see the TV? It’s going to be important, right? There it is, great. I can see the TV just fine. I’m excited about that. That means if I had people over, my camp friends, that they’re going to be able to sit around, watch the game, chill, watch Jeopardy, whatever it is that we enjoy to do with our friends. We’re going to be able to do that. The free standing dinette. Easily seats four. That’s nice. That would be fantastic for us. We look at the kitchen here. I’m looking around. First thing I see in the kitchen is these cabinets up on top. These are great. Lots of storage space there. Kind of a bead board background. It look kind of nice, a little different. Plenty of space. One thing I notice about this, it’s not quite a peninsula, they’re not quite a peninsula that comes out. It jumps out a little bit. What’s nice about that though is if the sink was right here, I’d be facing the wall doing dishes, that would just be terrible. This one is in an angle. At least I’m on an angle doing dishes and I can easily turn my head and talk to folks, maybe someone someone sitting at the kitchen table, I can look out the door. This is great set up here in the kitchen. I look over here around the stove. A lot of times what happens is these walls are so close to the stove. This one’s great. It has a little bit of extra counter space right here. If I have a pan that has an extra long handle or I have a couple of pans I’m trying to use at the same time, I have little extra space to move things around plus maybe a little bit of prep space right there as well. I like that. That’s great. That’s going to help in the kitchen when I cook. I’m going to walk up the steps here and head into the master bedroom. When I walk in here, what am I looking for? Well, I sleep here. As I sleep here, I’m thinking what are the things that are going to help me be comfortable with the way I live and the things I do and the way I sleep. I’m look at this, headboard is very important, meaning the headboard area. What’s there? Well, I have these great reading lights. One on each side. Reading at night, fantastic. I have light. Something else too I’ve noticed, this nightstand area, as you can see where this picture is, there’s actually a little tabletop there. That’s wonderful. If you look right there, you can see the outlet. Over here there’s another outlet and then right above that is actually a digital charging center. You can plug your USB right into that. Then down below, you’ll see on each side, we’ve got a little it of a cabinet. That’s great for storing stuff too. This is a great headboard area set up with the things that I need. Look here on the wall. I’ve got a wonderful wardrobe. Plenty of space there. Storage up above. This is a great. I’m going to come around. See this door, this door right here, if I close it, it ends up kind of splitting the cabinet. It has a good feel flow to the whole cabinet with the bathroom door. When I close this, it splits it but that leaves extra storage for me. In the bathroom, I’m going to spin around here. You can see there’s a built-in mirror. That’s nice. I can see all the way down and all the way up, that’s fantastic. Then I’m looking at the bathroom. What is it that I like about the bathroom? Well, first and foremost, notice that it seems so simple but I see it wrong so many times that this plug is right above the extra counter space right here. That’s what I want to see. I don’t want to see it over here and then my cords have to drape across. This is great. If you notice down below here, I’ve got some good storage. I’m excited about that. The shower has a nice design. Look at that. Nice design and some shelves in it and plenty of headroom in here. Way up, way up there. That’s fantastic. Plenty of room in here. I’m really excited about this. I’m going to walk through this second door here and back out into the RV. You can see, I’m right back to where I started. Hope you enjoyed that. That’s how Nate and I have been going around doing these reviews at the Hershey RV Show. Looking forward to doing a lot of more. But go Rvingplanet.com. 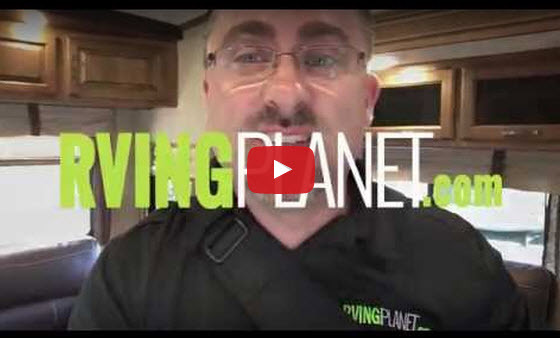 Rvingplanet.com. Go on there. Check out all the reviews and add your own. We’re looking for to seeing what you have to say about these RVs.